In a large bowl, mix all the ingredients but the Egg Replacer. Blend with a hand mixer for about 3 minutes. Then, add Egg Replacer and blend for another minute. Now, I made a dozen regular sized cupcakes, and 40 mini-cupcakes. I really like the little cupcakes with my coffee in the morning, and I wanted to make sure Sarah had some for her morning dessert too. I also found these cute mini cupcake papers/liners and really wanted to doll these cuties up. But if you don't like cupcake papers/liners, there are always options. Just spray your mini-cupcake pan with a vegan Baking Spray (read your label to make sure; some spray have lard in them) or you can always use silicone baking cups. You're going to want to spray those down, too. With a soup ladle, fill your cupcake pan cups/liners half-way. Then, bake till they're golden on top, and you can insert a bamboo skewer in the top and remove it cleanly. The mini should take less than 15 minutes. The regular sized cupcakes will take close to 20 minutes. Remove them from the pans and let cool on a wire rack. Here's where it gets fun! The Lemon Filling! Oh, how I love food with fillings! I do rave about it a lot, so I won't bore you with another delicious joy food rant - this time. What I will do is let you know that the Lemon Filling is kinda the hidden star of this cupcake. 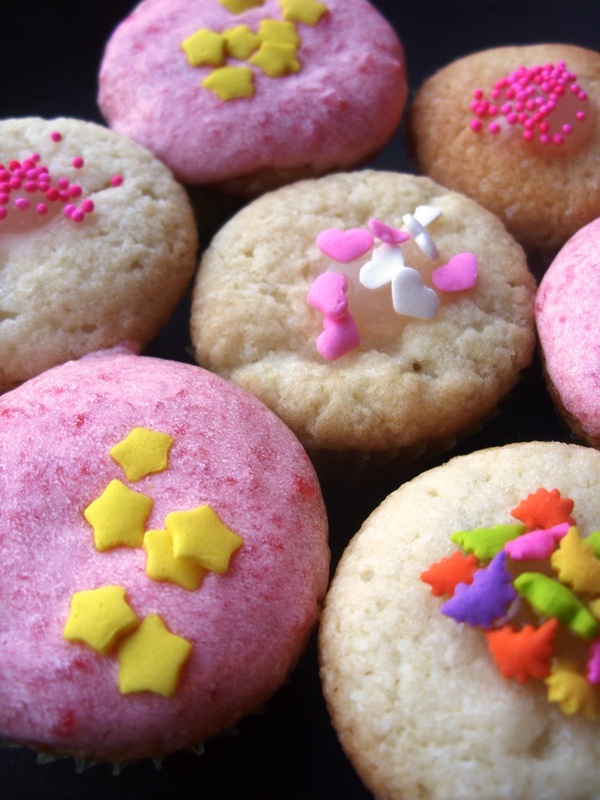 It is what really makes these little sweeties sing and Betty's recipe is already vegan! In a saucepan, mix Sugar, Cornstarch and Salt. Gradually stir in Water and Lemonade. Cook over a medium heat, stirring constantly, until mix thickens and boils. Boil and stir for 1 minute and then remove form heat. Stir in Margarine and Lemon Peel. Stir until the Margarine melts, then gradually stir in Lemon Juice. If you want to have that bright yellow Lemon Filling you find in commercial bakeries and baked goods, this is where you can add 2 drops of Yellow Food Coloring. We didn't do that, but would never judge you if you wanted to. Remove the Filling from heat and with a whisk mix until it is smooth. Then, cover the saucepan with plastic wrap tightly. Refrigerate for 2 hours. Once you cupcakes are around room temperature and you filling has chilled for 2 hours, you can fill your cupcakes! It's kinda hard to see the filling, but trust me, it's in there. To fill your cupcake, use the longest and thinnest decorating tip you have. Every brand of baking tool seems to have different numbers, but you want to use the one closest to a Bismark tip. 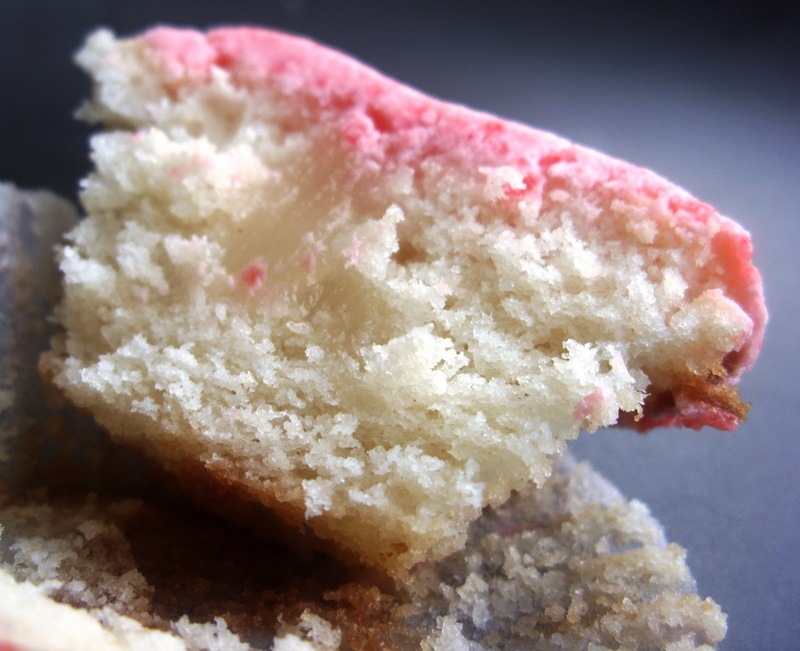 Just very gently poke a hole in the top of your cupcake with your frosting gun's Bismark tip. Then, gently fill the center. Stop filling when you feel the cupcake expand a little and see it start to come out of the top. So, now you're ready for your Cherry Frosting! We went with the more Cherry Glaze-ish version to make these kinda more like a Hostess cupcake - the most infamous of filled cupcakes. You can also use this frosting for making Simpson Donuts or Pink Eclairs. Yes, I will be making those again for Valentine's Day this year. It's been like 10 years since the last time I made them for the women and kids at the Domestic Violence Shelter I used to work at. 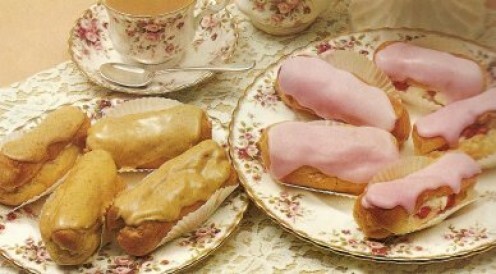 I think this blog gives me an excuse for a little Pink Eclair Comeback! Before we start, I should warn you this a very sweet frosting - another reason why they just have a nice glaze of it. It's just the right amount of sweetness to balance the tartness of the filling... like Pink Lemonade. Prepare Egg Replacer in a large bowl. In a saucepan, stir Sugar, Agave Nectar and Water until well mixed. Cover and heat to a boil at a medium heat. Stir it often. Then, remove form heat and pour into bowl over prepared Egg Replacer. Blend with an electric mixer using whisk attachments until smooth. Then, add remaining ingredients gradually and beat on a high speed for around 10 minutes. I find it makes a really smooth and light frosting if I tilt the bowl a little while I mix. It gets more air in there. To decorate, I just took the filled cupcakes and dipped them top down into the bowl. You'll get some drips down the side but that just means more frosting! Awww those Dinosaur sprinkles are cute! Those are some cute cupcakes!! omg the buffy link was awesome! your the best vegan geeks ever. Nice Cupcake, it looks delicious and healthy. Awesome blog!!! Keep it up! !